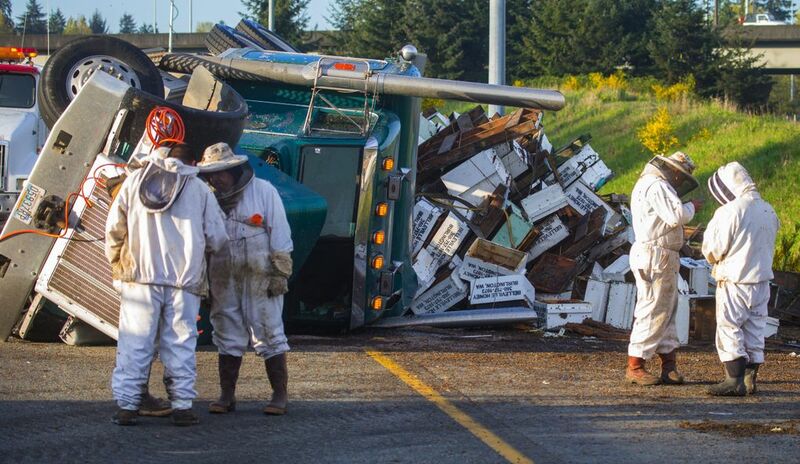 A semitruck rolled Friday morning, spilling a load of bees worth $92,000 on Interstate 5 at the Interstate 405 interchange near Lynnwood. 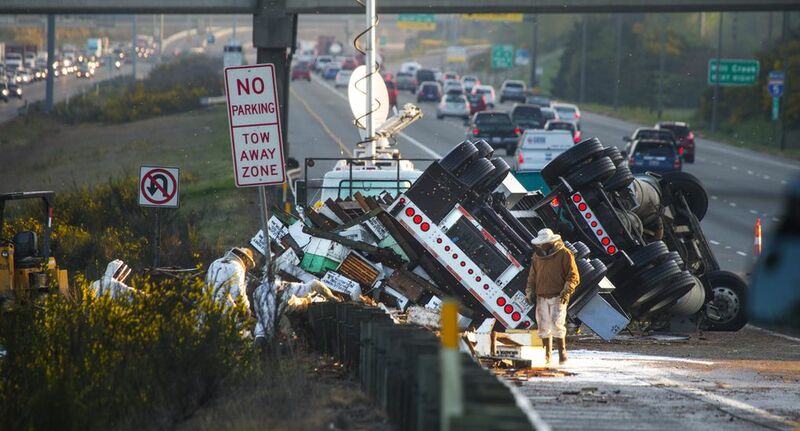 A semitruck rolled early Friday, spilling a load of honeybees on the Interstate 5 median at the Interstate 405 interchange near Lynnwood. 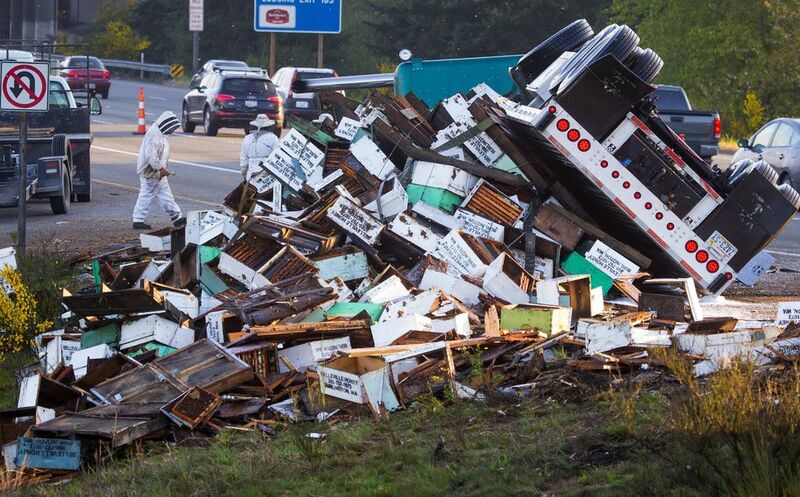 Beekeepers were on site within an hour of the 3:30 a.m. wreck to round up the honeybees, according to the Washington State Department of Transportation (WSDOT). As temperatures warmed and the bees became more agitated, firefighters sprayed a mixture of foam and water on the hives to slow down or kill some of the bees. Television reporters swatted at swarms of the insects surrounding their cameras and clumps of bee carcasses littered the roadway. A towing company was able to right the truck and pull it away by about 8 a.m., but traffic remained backed up throughout the morning as crews cleaned up the wreck. WSDOT advised drivers to keep their windows and vents closed as they passed the buzzing-bee boxes. 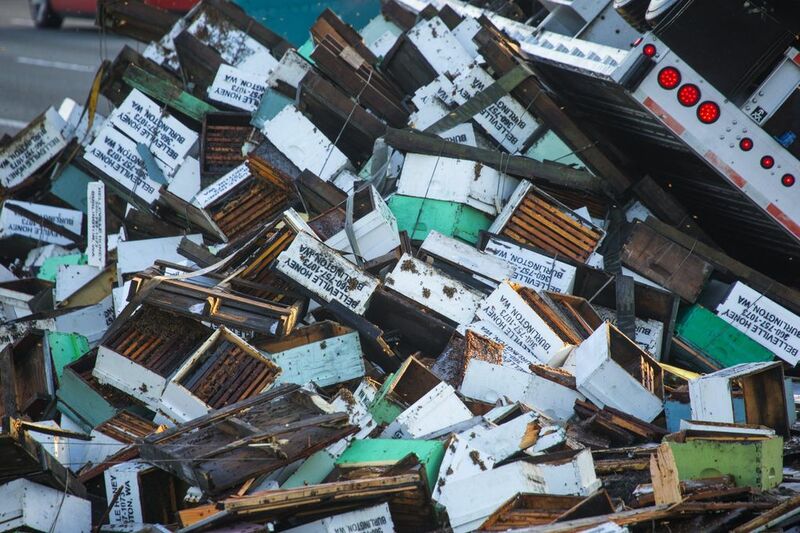 Lewis said the truck was exiting I-405 northbound when the 36-year-old driver from Idaho lost control, hit a guardrail and spilled the bee boxes. The overturned truck’s front-left axle and wheel were mangled in the wreck. Investigators are looking into whether speed was an issue in the crash, Sgt. Keith Leary of the State Patrol said. He said the driver could face traffic citations, but there were no criminal charges in the wreck. Leary said there have been several collisions near the sharp corner where I-405 merges with northbound I-5. 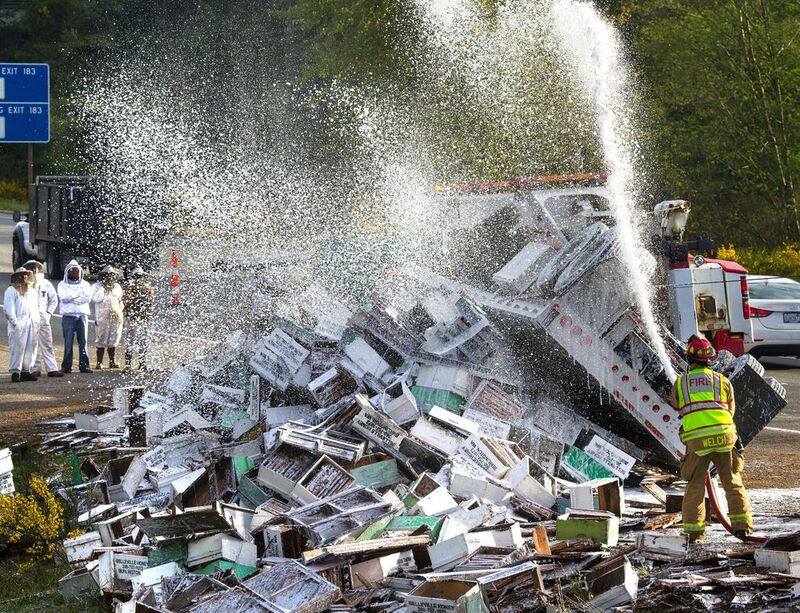 The overturned truck held 448 hives with as many as 14 million bees, Leary said. The honeybees, headed from Sunnyside, Yakima County, for pollination at a blueberry farm in Lynden, Whatcom County, were worth $92,000, he said. Seth Thompson, of Belleville Farms, said the company was able to save some hives. It’s a huge blow for the family business, he said. Thompson said eight company employees, outfitted with beekeeping gear, helped responders at the scene. 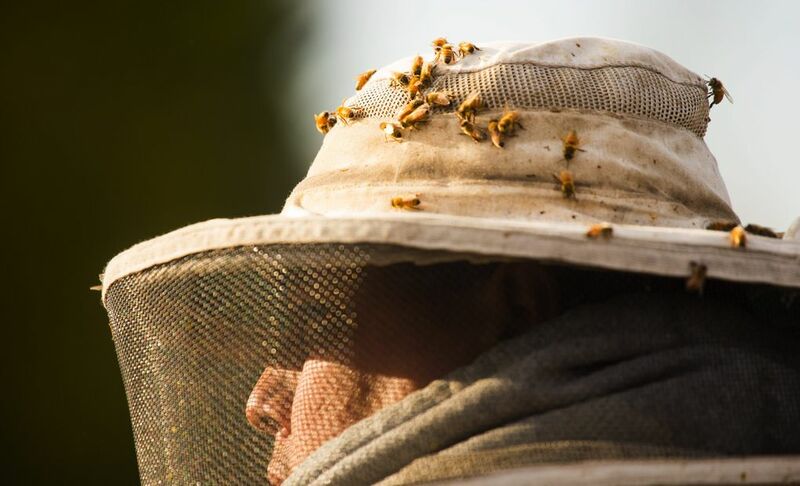 “We saved 128 hives before the sun came up and it got too nice,” he said. Leary said an excavator and dump truck were needed to remove the bee hives from the roadway. The wreck was cleared early Friday afternoon, he said, noting that he had about six bees in his patrol car. The tractor was totaled, according to a news release from the state patrol. Its trailer suffered about $750 damage. Leary said it was fortunate the wreck happened when there was the least amount of traffic on the roadway and that the truck spilled over into the HOV lane and shoulder. The bees were likely coming from California before Sunnyside, said Mark Emrich, president of the Washington State Beekeepers Association. Emrich said about 70 percent of commercial beekeepers bring their hives down to California to pollinate almonds. After California, “they work their way north to do fruits, bush berries, vegetables,” Emrich said. Spring and summer are the busiest season for beekeeping. Emrich estimated that more than 100 trucks carrying hives on Washington roads at this time of year. Drivers typically travel at night, when bees are less active. According to a report for the Washington state Legislature, about 500,000 colonies of honeybees were needed in 2012 to pollinate Washington crops. In the same year, about 97,000 of the colonies were registered with the state department of agriculture, though that figure is from self-reported data and not all hives are registered. Walter Sheppard, a professor of entomology at Washington State University, said about 400-500 colonies can fit on a truck. 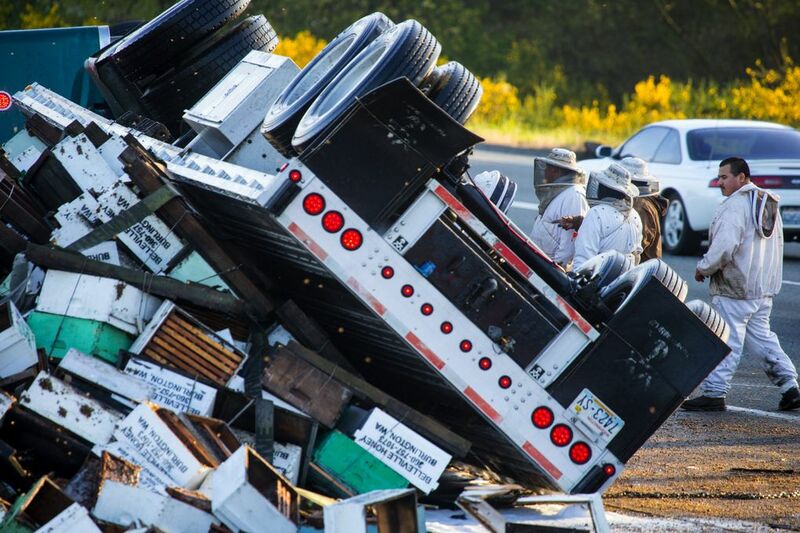 “It’s a pretty normal thing to see trucks loaded down with bees on the highway,” said Sheppard. Emrich said the firefighters, beekeepers and state troopers at the scene did not have much choice but to knock down the bees with water and foam. “They’re little flying solar panels. As soon as light hits them, they want to be active,” said Emrich of the bees. Emrich said bee colonies are very difficult to recover because the entire hive must stay intact, with its single queen, the worker bees and attendant bees. Honeybees rarely sting people, said Sheppard, unless you disturb them or they feel need to defend their colony. If a honeybee stings, it will die. Unless the wreck blocked traffic and drivers got out waving their arms, Sheppard doubted the public was in danger. “I couldn’t imagine it being a public-health menace, but it’s a big nuisance,” said Sheppard. 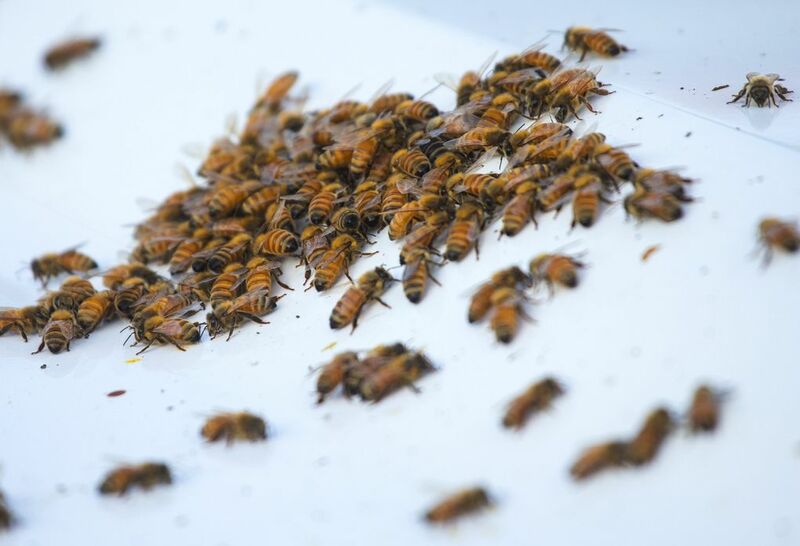 Sheppard said a couple of trucks carrying honeybees crash each year, but it doesn’t make as much of a buzz unless it’s near a city or major roadway. Seth Thompson, of Belleville Farms, said company was able to save some hives. Said it's a huge blow for the company heading into summer. We asked our Twitter followers to send us their best bee-inspired songs.